The Chiropractic Economics magazine monthly Facebook giveaway program continues to be popular with the magazine’s readers, who have the chance to win valuable products for their practices. The new campaign for October 2013 is for a $1,000 Apple gift card. This month’s giveaway, from EHR software vendor ChiroTouch, is for a $1,000 Apple gift card that can be used to purchase products from Apple Computer. “ChiroTouch is a long-term partner with Chiropractic Economics. We are committed to offering DCs a best-in-class ONC-ATCB fully certified practice management software solution,” says Robert Moberg, president of ChiroTouch. This giveaway breaks new ground as it is in the form of a contest. 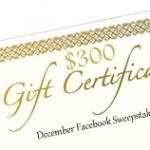 Participants visit the Facebook page of Chiropractic Economics magazine (facebook.com/ChiroEcoMag) and click on the “Giveaways” button. There, they can view the new ad from ChiroTouch and suggest a slogan to match the picture. The winning entry will be chosen by ChiroTouch. To access the giveaways tab on a mobile device, click here. The October giveaway will end Oct. 21 at 4 p.m. Eastern time, and one winner will be selected from the entries. This particular giveaway is only offered to fans who “Like” both Chiropractic Economics and ChiroTouch (facebook.com/ChiroTouch) on Facebook. ChiroTouch, by Integrated Practice Solutions Inc., is the premier provider of fully-certified innovative chiropractic software technology solutions for the chiropractic industry. Fusing advanced software systems with superior support services, we partner with chiropractors across the country to help them automate operations, improve patient care, and increase profitability. Visit chirotouch.com.